It proved a popular decision – not just with ourselves, but with virtually everyone we mentioned it to. Our taxi driver further added to a sense of anticipation that had been raised by Irish friends back home, as he drove us to the very place. “Ah, the Clarence, now that’s one of our best.” The fact that Bono and The Edge of U2 own this fine establishment naturally adds to its glamour, but you sense this is certainly not the only reason for the hotel’s fame. 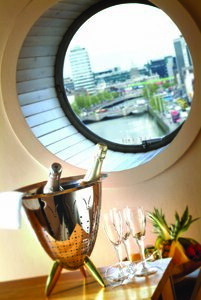 To those not familiar with Dublin, the Clarence is located in a handsome 19th century building that happens to be just about perfectly situated from a visitor’s point of view: on the south bank of the River Liffey, backing on to the lively hub of restaurants, bars and nightclubs that is the Temple Bar District, and within easy walking distance of such iconic landmarks as Trinity College, O’Connell Street and the shopping of Grafton Street. Now those of you who expect the Clarence to be some kind of rock temple or grunge palace might be disappointed. As for myself, I was rather relieved to find that the creators of such grand rock anthems have shown an obvious taste and love for one of their city’s architectural gems, restoring its impressive Arts & Crafts detailing, Shaker-style furniture and solid wood panelling reminiscent of the Jugendstil era. The result is highly effective, creating not a stuffy museum piece but a highly original and personal hotel made thoroughly contemporary through the understated use of simple modern designer touches, dashes of colourful art and, of course, such modern amenities as flat screen television/monitors. Dominated by warm chocolate and vanilla tones moulded together with understated charm, this is a place where luxury need not be fussy. 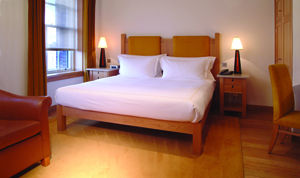 If you’re coming to laze away the days and catch up on your sleep, this is not the place. 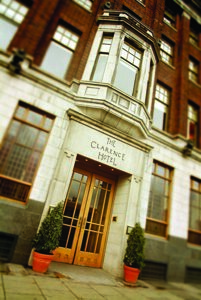 Best to book a spa somewhere, for not only is the Clarence located upon the doorstep of the famous Temple Bar District, but this is a local hotspot in its own right, drawing an after-work crowd of professionals to its lively and ambient Octagon Bar, or groups of business and romantic diners to the haute cuisine Tea Room Restaurant. If you do want to relax in suitably distinguished surroundings you could always repair to The Study, where a brandy and a copy of the Financial Times make you look just the part. Bravo Bono and Mr Edge for lovingly creating a hotel that is as much a one-off classic in its ambience and personal attendance as it is in style and architecture. The only thing to better a suite here is a penthouse suite here – just ask Bill Clinton. This entry was posted on Friday, November 11th, 2011 at 11:53 am	and is filed under architecture, Design, General Interest, Travel. You can follow any responses to this entry through the RSS 2.0 feed. Both comments and pings are currently closed.